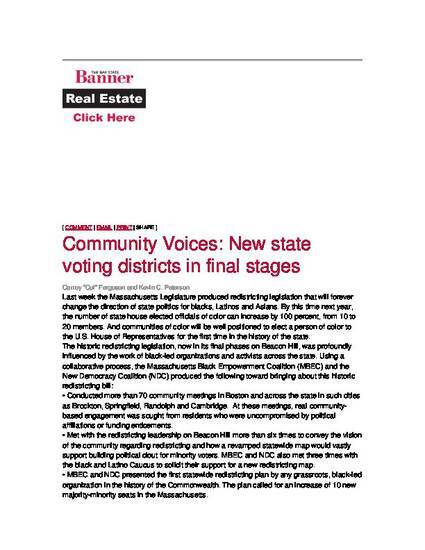 "Community Voices: New State Voting Districts In Final Stages" by carroy u ferguson, Dr.
Last week the Massachusetts Legislature produced redistricting legislation that will forever change the direction of state politics for blacks, Latinos and Asians. By this time next year, the number of state house elected officials of color can increase by 100 percent, from 10 to 20 members. And communities of color will be well positioned to elect a person of color to the U.S. House of Representatives for the first time in the history of the state.